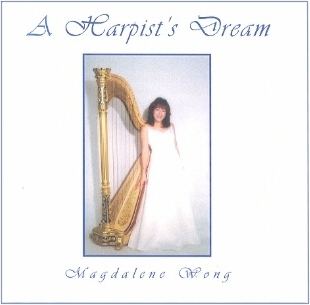 I have recorded 3 CDs entitled A Harpist’s Dream, Angel and Two Harps For Christmas. A Harpist’s Dream is a showcase of 17 of my favourite harp arrangements of classical and popular pieces. Angel is a collection of my original compositions for solo harp. Price – US$21.95 which includes overseas postage. Two Harps For Christmas is a musical collaboration by sisters Kae Chee and Magdalene on two harps. Price: US$21.95 which includes which includes overseas postage. * Package price for 3 CDs: US$49.95 which includes overseas postage. Disclaimer: You acknowledge that Magdalene Wong provides these demonstrations with no warranty as to the results or fitness for purpose. You also acknowledge that Magdalene Wong shall have no liability for any loss or damage that you suffer as a result of downloading or viewing or hearing these samples. Your use of the downloaded demonstrations signifies your acceptance of these terms.